That’s a wrap, folks. Our second Interchange Madrid conference came to a close today. We packed up our bags, exchanged information with our new business connections, and popped a couple of Ibuprofen to keep the hangover at bay. Speaking of hangovers, I wanted to give a massive shout-out to the conference party last night. Conference parties can often be awkward or boring, but this was one of the best events I’ve been to in my career. There were incredible acrobat type performers, dancers, and of course Ivanti’s favorite band, Exit Strategy, which is composed of CMO Steve Morton, CEO Steve Daly, and Channel Manager Brad Wilson. We keep it in the family here at Ivanti. And you know it’s a good night when over half of the crowd ends up dancing on stage at one point or another. So for one final time until Interchange Nashville, here is an Interchange recap. Pablos is a futurist and hacker who focuses on using technology in creative and innovative ways to reduce inefficiencies. He shared examples of using innovations in technology in several categories, including pap smears, nuclear waste, malaria, and sewing machines. He encouraged listeners to think outside of the box when it comes to technology. “We can do better on these things, but we’ve got to try. There is so much potential in advancing new technologies, we’re just at the beginning,” Pablos said. We ended the keynote with our final grand prize giveaway, a 2500-euro sports event package. Steve Morton sent everyone home with well wishes and hopes to see everyone at the conference next year. We featured a sponsor and service showcase where attendees got a chance to meet our sponsors and learn about other Ivanti services. Our sponsors for the event included Five(9)s, Invent, ITSM Group, MarXtar, Parallels, and Xpandion, all of which had a booth in the showcase hall. Attendees got to visit the booths and learn about what all of these awesome sponsors do in the IT industry. We highlighted five Ivanti services at the showcase as well. Product Design (UX) Group – Where attendees can help us design better software by signing up for a testing session and trying our latest prototypes. One of the best parts of Interchange is the chance for attendees to provide input and feedback that we bring back to our products. Ivanti Insiders Program – This is great chance to work closely with us while winning a lot of swag! 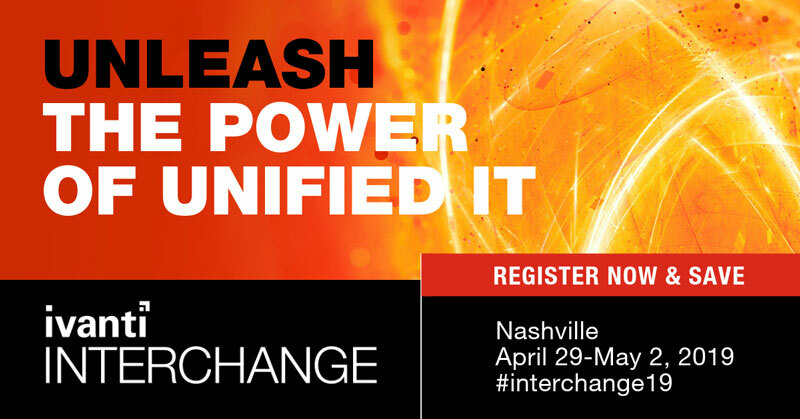 Interchange IT Podcast – Attendees got the chance to get interviewed on Ivanti’s technology and IT podcast. Customer Experience area – Where you can track where you are in the customer journey and help Ivanti make your experience world-class. This was hand-in-hand with Ivanti services success as Global Academy and Technical Relationship Managers. 5 For The Fight – A place for attendees can get involved in Ivanti’s relationship with 5 For The Fight, and donate to cancer research while highlighting someone you’ve known who has fought cancer. Like day one and two, we had some awesome breakout sessions. Some highlights for our customers included Architecting Software for the Future: A Peek Inside the Ivanti Kitchen, Risk Management Insights in a World Gone Mad, Software Audit – How to Best Prepare for an Audit and what you Should and Should not Say to an Auditor, and Windows 10: Migrate or Pay the Price. Thanks to everyone who came to Interchange Madrid. We had so much fun and learned so much from all of you. Can’t wait to see you next year, travel safe back home!